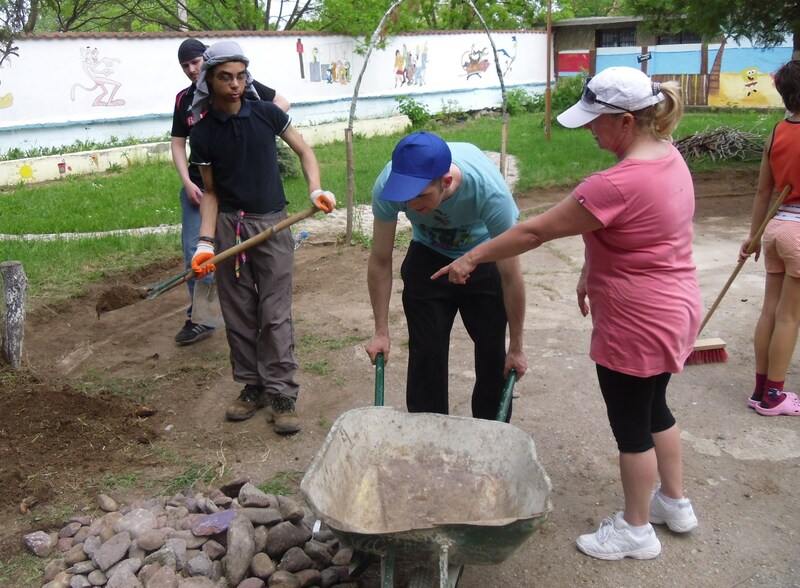 A group of nine young people with a range of learning disabilities have completed two voluntary projects at an orphanage in Bulgaria as part of their silver Duke of Edinburgh awards. The 16 to 25-year-olds, who all attend Strathmore College in Stoke-on-Trent, a college for people with a range of learning disabilities, worked at an orphanage in the village of Doganovo near Elin Pelin in Bulgaria. One project involved removing old wooden panels in a playroom, which were considered a fire risk, repairing the plasterwork and then painting the area. The other saw the volunteers clear rubbish from the front garden and create safe and decorative pebble paths for the children. This involved digging eight inches into the hard soil, laying concrete and then spreading pebbles taken from a local river bed. Jim Glover, vice principal at Strathmore College, said: “All our young learners worked incredibly hard on the two main refurbishment projects we came to help out with. “The learners, working under supervision and supported by our staff, and seemingly never tiring, worked throughout our two-week stay and took it as a personal challenge to do their best for the orphans. In doing the work they sought to gain the community service element of their Duke of Edinburgh silver award. In their time in Bulgaria, the students also got to grips with traditional local food, the language and culture, and enjoyed a guided tour of Bulgaria’s capital, Sofia. “All the learners had language lessons throughout their stay and tried their best to speak the language with staff and children at the orphanage,” Glover added. “Our learners felt their disabilities became invisible. It was incredibly liberating and confidence-building for the students and they felt that the language differences levelled the playing field for them. “We are very proud of what the learners achieved and how they and their families were so committed to ensuring it was of maximum benefit to all concerned. “We have all had a fantastic opportunity to see a different way of life and to experience the lives of others less fortunate than ourselves through living and working with these wonderful people.